I, ashamedly, have never had a chance to read one of Malcolm Gladwell's books (The Tipping Point, Blink, and Outliers). Now that I have finished grad school, I will finally have the time! If his opening Keynote Address is anything like his writing, then I am hooked. Heady stuff, though explained in a simple way. We've all heard the phrase a million times. Gladwell, however, manages to find empirical proof of this statement, starting with the 10,000 hour rule. He says that, according to research, you need 10,000 hours of practice in something to become a true 'specialist.' All told, that is 4 hours/day for 10 years. "Mozart is a late bloomer," he joked. Mozart took 14 years to create his first 'good' piece of music. Tying this to education, Gladwell states that it is someone's attitude toward effort that makes someone successful. In other words, it was not just Mozart's talent that made him great. He WORKED HARD! Gladwell also described an example from an International Math exam which had a long psychological survey at the beginning. A researcher tried to find a correlation between the countries whose students completed the survey and those who didn't and the test scores on the exam. Amazingly, the correlation was that those students who finished the survey also scored better on the exam. To Gladwell, this was the perfect example of attitude over talent. Those students who had the motivation and the determination to finish the questionnaire would also have the motivation and determination to study hard and do their best on the exam. I agree with Gladwell that Western countries (like the U.S.) don't teach that attitude can make a difference. Many of us believe that we are naturally born with a talent or a gift that will define us for the rest of our lives. For this reason, many children are not taught to put effort into those things with which they struggle. Instead, their strengths are emphasized. Just think of Cliff's Notes and SparkNotes, or sites that sell college papers. Why put in the effort if you don't have to? Without challenge, how can one learn anything? Coming from a large inner-city school perspective, I happen to disagree about class size. Our students DO compensate, but it does not help them succeed. I had a 1st grade student who copied magnificently from books and other print materials every time she was given a writing assignment. From a distance, she looked like an on-level writer. If you took the time to read what she wrote, it was copied, verbatim, from a book or the room somewhere, and she couldn't even identify the letters she had made. Other students compensate by copying answers or bullying others into giving them the answers. How this breeds success is a mystery to me, since most of these students leave our school in 6th grade on a 3rd or 4th grade reading level. We all know the statistics when it comes to level of education and incarceration rates. In the broader sense, as Gladwell stated, adults need feedback too. He explained that often, one's confidence in one's knowledge grows faster than the knowledge itself. For this reason, decision-makers on every level, teacher to congressman (or woman!) need to know when they are succeeding in the public eye and when they have either failed or let their constituents (yes, teachers have constituents, too!) down. In pop culture, it is the norm to expect instant gratification. As Gladwell explained, if you don't make the hit the first time, then you're out of luck. Students often fear failure. Maybe they are justified. In the larger world, one failure may be the first and last one you ever have. I believe that a life well-lived is full of failure. It is failure that can serve as feedback and motivate us to work harder, thereby increasing our hours working on a project or a concept. What's that saying? "Whatever doesn't kill you makes you stronger?" I'm not sure whether the Media influences kids' fear of failure, but I could see how watching pretty people on TV succeeding and winning money and when they fail, being shamed, could really have an effect on a young child. Children need first-hand experience with failure, whether it be through a Science Fair project or simply a strike out at the Little League game. Without this, they will never be adventurous and creative for fear of failure. It took me 2 days to finally sit down and write all my thoughts down. I'm not even sure if anyone will read all of this rambling. For me, reflecting on Gladwell's speech was a way for me to organize and unload some of the thoughts floating around in my head. I can't wait to pick up The Tipping Point this summer! Now reading this a week later, it still rings true. During an Elluminate session led by Steve Hargadon from Classroom 2.0 last night discussing EduBlogger Con & NECC Unplugged, I realized that I had been lucky enough to enter a community of people as passionate about collaboration and furthering their own knowledge and learning opportunities as I am. I hope to continue to learn from these amazing people! Kevin Honeycutt (http://kevinhoneycutt.org) says that he teaches on the iPod touch and then shows the kids the guitar, explaining the similarities. The applications use the same basic musical knowledge (chord names and rhythms) that a student must know to be a successful musician. He said that he hooks more than one iPod up to a jack and then connects them to a computer. The computer is running GarageBand, and by simply choosing the 'Real Instrument' option the kids can record right into GarageBand! 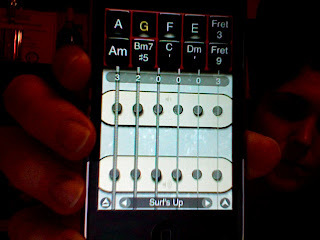 iShred - Has songs pre-installed with chords set up for you to strum. It's so easy a child could do it! He turned the Blogger's Cafe into a music lounge and got lots of people of varying ages to give it a try! Q: Are bricks and mortar schools detrimental to the future of education? Assembly line/factory jobs are declining. Instead, children must compete in a global world with higher order thinking skills. Modern day schools haven't really changed over the past few decades. Defining a school by a bricks and mortar 'boundary' cuts off children and is detrimental to the future of education. This assumes that every learner in the building learns the same way and has the same needs. In the current global economy, we must educated every child with smaller budgets. Moving away from brick and mortar schools will meet this challenge and allow students to access materials and ideas from all over the world. Bricks and mortar schools limit socialization. Students must be able to communicate and collaborate locally and globally. This communication can be face to face and asynchronous without the need for bricks and mortar schools. While our world has changed, our schools have not. Bricks and mortar schools are necessary. We must 'get together' to learn something. Many of our schools are run down, shabby, and under-served. Buildings can become great tools for learning. Don't just 'throw out' our schools. They are the vessels for the wishes of our democracy. They hold together communities and provide services for those who cannot get them anywhere else. Families can interact, get health services, and use resources like computers. Schools are a "house of learning;" a place where we 'get together' to learn. We use technology to support medieval practices like NCLB. A classroom is not a box containing a group of small desks and one big desk. Schools contain science labs, dancing, arts and other extracurricular activities. Technology can allow for bad teaching done on the cheap. Online learning does not provide a holistic learning experience. In an online course, individualization is not customizing a multiple-choice test. When talking about socialization in schools, the # 1 infraction in school is talking. If no talking occurs in an online environment, where is the socialization? Laptop programs decentralizes knowledge. Teaching roles crumbled when teachers saw what their students could do. We need a new envisioning of what bricks and mortar schools could be. Closing the gap in resources and opportunities for students. We must use a combination of face to face and online. It's not black and white. What about the child who has a single parent or can't access the digital/online learning? A brick and mortar school serves the community, not just the students. Our students aren't 'self-directed' by birth, they require teachers to guide them. When students are socially connected to their schools, they have more success. Online learning is often missing this connection. This is why a hybrid model best serves students as opposed to completely asynchronous learning. We need socialization because of 'social capital.' Students should be connected globally and locally through PBL. Bricks and mortar should still exist with an online option. We must learn to live your life in an international community. We don't need a place for teachers, we can now have teachers from around the world teaching students from all over the world simultaneously. Bricks and mortar is not what facilitates learning, it limits learning to 8 hours a day. I feel excitement walking into the building, even if the building itself is not perfect and is in disrepair. Teachers are adapting the curriculum to meet the needs of our students. Bricks and mortar schools create strong connections to our local community. We all have one need that we share--the need to work in groups and as a team. School provides a place for this. On the topic of socialization, the dedication of our teachers and their love for what they do rubs off on students and motivates students. Through the enthusiasm of teachers and faculty that we learn to love academics and are prepared for our life. We need online education. We need to reinvent or schools. If we don't have bricks and mortar schools, we will 'lose a generation' in our communities. These students depend on their community school for opportunities and services. There is common ground on both sides. We need the personal connection, but technology will help enhance teaching. Lawsuits when using Web 2.0 technologies? Parents must know it's being used and that there is a set of expectations. Lawsuits can exist inside and outside the classroom, so what's the big deal? After the audience voted using the Turning Technologies clickers, it was resolved that the large majority of the audience felt that bricks and mortar schools are NOT detrimental to the future of education. I felt, coming into the debate, that schools need to physically exist to serve their communities. However, these schools also need to make learning opportunities available to students that expose them to and help them interact with people outside their community. They need to be active members in the global community to be successful in today's marketplace and to be good global citizens. This is exactly what Cheryl Lemke was proposing - a hybrid model. If you have comments or anything you'd like to add, please add them below! So, Day 2 is over and now I'm sitting in the "Blogger's Cafe" trying to piece together the events of yesterday. I got into the Convention Center after having a wonderful brunch with a friend around 1:30pm. Just enough time to get seated for the Welcome Ceremony. The ceremony had a Movie Awards theme, with Mario Armstrong (the MC/host) dressed as Darth Vader and moving around on what looked like a segway. The Star Wars theme continued throughout the ceremony. Then it was time to visit the historical timeline of technology relics. Even at my young age, I remember most of them! I actually have the iPod underneath at my house and I think it still works! I didn't realize that iPods came out in 2000. They have really evolved over the last 7 years! This is the computer I learned on in elementary school! I never used this, but it's an Atari something or other. We had Atari in my house in the early 80's. After checking out the 'museum,' it was time to meet up with some Philly friends. We attended the Keynote together, which be my next post. James Surowiecki’s groundbreaking book is so full of poignant statements and analyses that trying to find one quote to sum up the book’s theme is difficult. However, two quotes stick out for me in trying to convey Surowiecki’s main theme. On the topic of how best to run an organization, Surowiecki states, “Suggesting that the organization with the smartest people may not be the best organization is heretical, particularly in a business world caught up in a ceaseless ‘war for talent’ and governed by the assumption that a few superstars can make the difference between an excellent and a mediocre company” (p.31). This is quite a prediction (the book was published in 2005) of the Walter Madoff scandal and the CDS phenomenon that recently turned the financial world upside down. On the topic of how groups organize themselves in American society, he explains, “…in liberal societies authority had only limited reach over the way citizens dealt with each other. In authority’s stead, certain conventions—voluntarily enforced…by ordinary people—play an essential role in helping large groups of people to coordinate their behavior with each other with out coercion” (p.97). Here, he is speaking of cultural ‘norms,’ such as ‘first come, first serve’ seating on subway cars in Manhattan. In the context of the Internet, which is not regulated by any central authority, these conventions that coordinate behaviors are very much in play. Users have created their own ‘norms’ and expectations for the web in the same way people on the subway understand how seating works through a set of unspoken cultural rules. In the context of students and learning, this book provides teachers with an understanding of how their students, who most likely participate in the online world, are part of a bigger picture in creating an organized culture and in making good decisions for the future. When students participate in social networks, file sharing, or any other kind of social construct on the web, they are part of an important decision making process. Since the Internet is controlled by its users, not a centralized authority, users have a huge stake in its success and its progress. This has implications for how we teach students good digital citizenship and safety. As Surowiecki states, “It may be in the end, that a good society is defined by how people treat strangers than by how they treat those they know” (p. 112). With an ever-increasing online community, this society is now a global society. Educators are now in charge of the huge task of making students good global citizens. Teachers should be models for how to use the Internet and communicate with others online. The better informed the youth are, the better future prospects are for society in general. Most communication and collaboration in the next decade will occur online. This book manages to link every aspect of modern society through the underlining theme of how groups of individuals function in many different situations. While the theme remains the same: “The idea of the wisdom of crowds is not that a group will always give you the right answer but that on average it will consistently come up with a better answer than any individual could provide.” (p. 235), it plays out differently in different arenas. Surowiecki addresses the theme as it plays out on the Internet, in traffic jams, in mobster movies, Linux, the stock market and the business world in general. It is a relevant analysis for any audience. Whether you are an educator, an economist, a stockbroker, a commuter, an engineer, a frequent blogger or contributor to YouTube, you will find something relevant in this book. Ok, ok, ok, call me Arlen Specter. I broke down and joined Twitter. As a Technology Specialist attending a four day technology conference in DC, it really just had to be done. While you make a great point, Nana, about all social networking sites not being a 'one size fits all,' I discovered that by not participating in Twitter I was missing out on an opportunity to network and stay informed at the conference. I didn't imagine that I would need to learn things like how the @ works or the # in creating Tweets. I basically use it to keep up with what 'important' people in the education and technology field are saying. I could see it taking up a lot of people's time looking through hundreds of posts and links. Fortunately, I have no luxury of extra time! It is pretty amazing how Twitter users have molded it into what it is today. My recent reading of The Wisdom of Crowds has gotten me thinking about this phenomenon of bottom-up coordination and management on the internet. I highly recommend picking up this book. It's a bit dense, but worth it!